Chart star Calvin Harris has lost seven months of work on his new album in baggage problems at Heathrow. The dance musician, from Dumfries, in the south of Scotland, was returning to the UK from America when the bag containing his laptop went missing. A spokeswoman for his record company confirmed it contained the only copy of work on Harris's second album. "This is not good news for me," he said on his website. "I have been walking in circles for a couple of days." The DJ and producer's first release - I Created Disco - was a top 10 hit last year and carried the debut single Acceptable in the 80s. 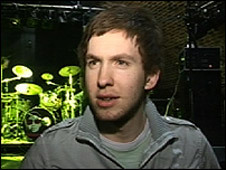 The album's success led to him working with the likes of Sophie Ellis-Bextor and Kylie Minogue, for whom he wrote the forthcoming single In My Arms in his bedroom on a 15-year-old computer. A spokeswoman for Columbia Records confirmed that the lost laptop contained several new songs the DJ and musician had been working on. "He has lost the only copy of the new album," she said. "It is a big cause for concern - months of work have gone into that." She said it would not affect his live performances as they did not involve the use of the laptop. However, it could set back work on a new album for some time. "They have offered about £750 in compensation," said the spokeswoman. "You can't really put a price on something like a new record." British Airways has said its priority is to reunite passengers with their luggage as soon as possible. More than 400 volunteer staff have been working to deal with the situation. Thousands of bags were caught in a backlog after the opening of the new T5 terminal at Heathrow this week. Numerous flights were cancelled due to problems with the baggage handling system. British Airways has admitted that the chaos surrounding the opening of Terminal 5 has so far cost about £16 million.